Pioneers in the industry, we offer kids educational books from India. 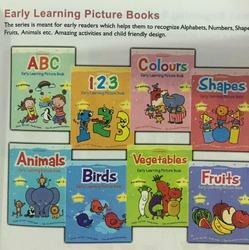 Picture books, early learning , small begining ( alphabets), cursive writing, number books,color fun, picture dictionary, Rhyme time, General knowledge, Grammer chest, computer scinece, Educational charts. Imported books from Dover USA, like on Physcis, Mathematics and Engineering etc. Thoery of sound , Atomics physics, Electromagnetism, Electricity waves, Fluid dynamics, Hydrodynamics, History and philosophy of Physics, MAthematical and Theoretical physics, Opitcs, Quantam Mechanics, Thermodynamics, Genral physics. We have many range of school books imported.